Join us on a six day Salmon Fishing holiday in Fort William based on The River Lochy. Experience fishing under the backdrop of Ben Nevis, the highest mountain in the UK. 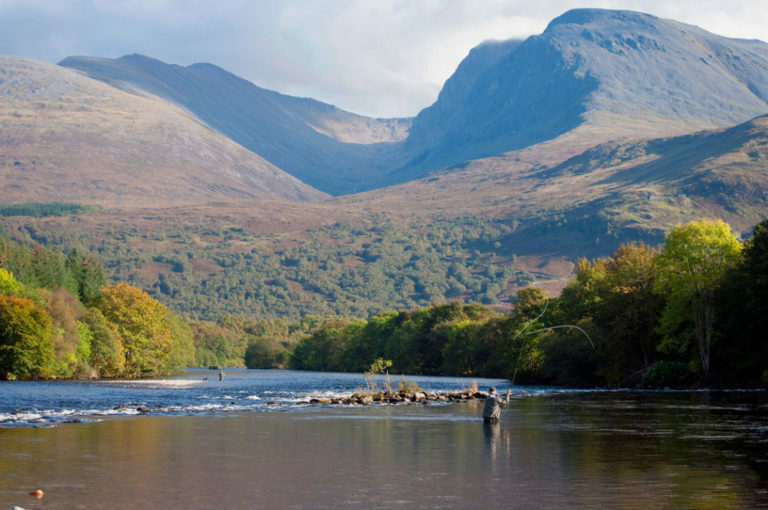 The River Lochy offers spectacular views of Ben Nevis and the surrounding mountain ranges and was crowned “The Queen of Scottish Salmon Rivers” by the late great John Ashley-Cooper. The River Lochy undoubtedly offers some of the most tranquil and picturesque salmon fishing in Scotland but is also known for it’s large Lochy Springers, with an average of 15-17lb’s and a history of bigger fish of up to 40lbs so there is a real chance of a fish of a lifetime! Over your six day fishing holiday, you will fish all 4 beats of the river on a daily rotation and then go back to where you started forday 5. Not only does this give you the opportunity to fish the whole river but also takes you back f thor a second go at some familiar water. If you can not commit to a 6 day break then you may wish to check out our three day package which will give you three days fishing on three different beats. If you are in pursuit of one of The River Lochy’s large fresh run Springers, the best time of year is from May to early July when the bigger fish are running to get to the upper part of the system. From July through to August the fish are normally Grilse (smaller salmon that have spent one year at sea) mixed in with larger summer salmon (but there is always the chance of encountering a big one). The Autumn fishing in September and October sees a run of normally coloured fish making their way up river. Please get in touch for prices and availability for 2019. Accommodation can also be arranged at the time of booking.